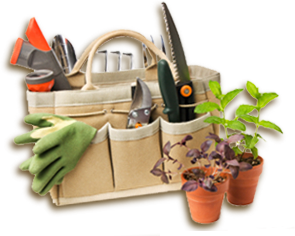 A great way to freshen up your garden is by trying a new garden design. This year why not take a stab at adding some height and pizzazz to your garden. If you are familiar with the container design concept of fillers, spillers, and thrillers, these plants would be the thriller of your garden. They are the attention grabbers or “drama queens” and are the plants that will add the height and pizzazz to your garden. Canna: Canna is a summer blooming plant. The plant has tropical foliage spikes that are topped by brightly colored flowers. This plant is also referred to as Canna Lily. The foliage on the plant comes in green, bronze, and variegated colors. The flowers are in a variety of colors including orange, magenta pink, red, and yellow. They can bloom from late spring until fall. Cannas need a lot of sun and moist, well-drained soil. This plant will grow 4 - 6 feet tall. 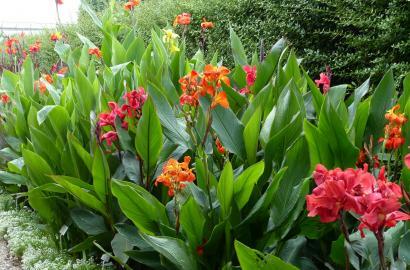 There are dwarf varieties of Canna which grow up to 3 feet and are great for containers. This low-maintenance plant is winter hardy in zones 7 to 10. 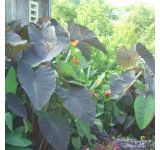 Elephant Ear: If you love foliage this is the plant for you. 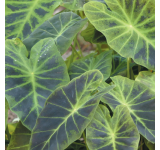 The plant is also known as Colocasia or Taro and brings the tropics to your garden. 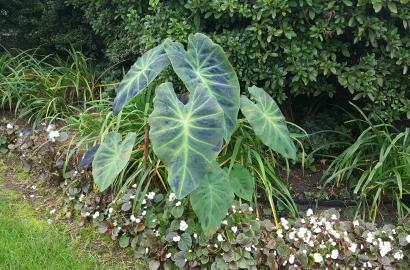 Their name comes from their giant heart-shaped leaves that look just like elephant ears. In recent years, these plants have become very popular as new varieties that are almost black, spotted, or have different colored stems and veins have been introduced. 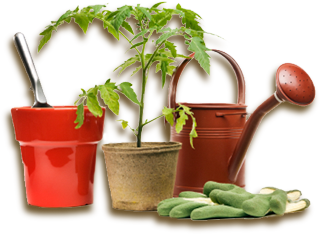 When growing these plants in garden soils, provide regular moisture, especially during dry summer periods, and do not allow the soil to dry out. These plants also do well in containers. This plant is native to tropical Asia. Tubers may be left in the ground for zones 8 -10. 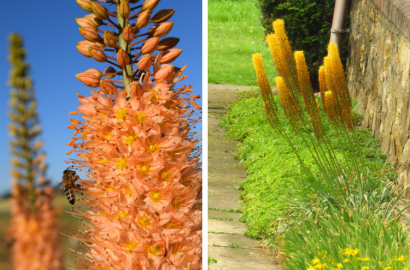 Eremurus: This plant is also known as foxtail lilies or desert candles. It is a perennial that has a long spike and flowers that come in shades of copper, orange, pastel pink, snow white and yellow or a combination of these colors. Eremurus has hundreds of small individual flowers on each spike. The spikes can grow 4 to 5 feet tall. Bloom time is late spring – summer. Eremurus prefers dry soils and full sun. They make great cut flowers and can last up to 2 weeks. If you live in a windy area, you will have to stake the plant. The plant is deer resistant and drought tolerant. If you have children or pets beware as part of the plants are poisonous if ingested. The plant is native to drier regions of western and central Asia. The plant is hardy for Zones 5 -9. Liatris: Liatris are a wildflower native to the grasslands of the Midwest. 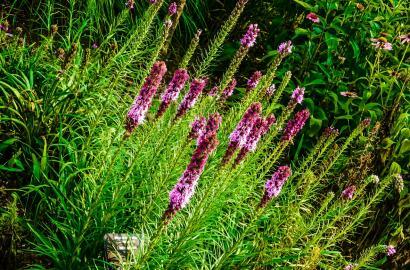 This perennial plant is also known as Gayfeather or Blazing Stars and is native to North America. The flower spikes grow 2 to 5 feet and butterflies love them. The purple or white blossoms are unusual as they flower from the top of the bud down rather than the other way around. Its wand-like blooms are on top of grassy leaves. The plant may need additional support if planted in a windy location. It grows best in soils that drain well in a sunny location and during the winter it requires some mulch to protect its roots from being pushed out of the ground by cycles of freezing and thawing. 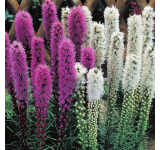 Liatris are hardy in zones 3-8. 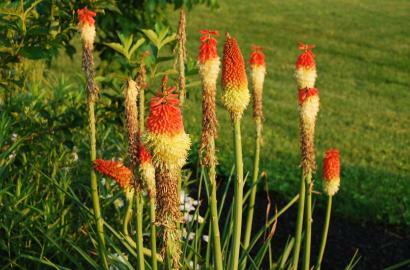 Red Hot Poker: Red Hot Poker, also known as Torch Lily, is a dramatic back of the border perennial. It grows 2 to 5 feet tall and its flower spikes come in in shades of yellow, orange and red with most varieties having tops that are red/orange on the top and yellow on the bottom. Depending upon the variety they bloom from June to August and look best planted in groups of 3 or more. They are drought tolerant once established and will be long-lived if they find a spot that suits them. After the plants finish blooming you can keep the spikes in place for visual interest or remove them and trim the grass-like foliage for a neater appearance. 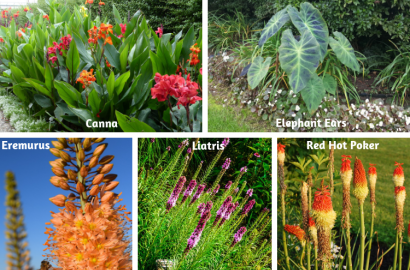 All of these plants can add some “wow” to your garden design. If you have any to add to our list let us know!